Every year, my trek to the Great Minnesota Get-Together is both the same. And, absolutely different than years past. But, always, consistently, fun and memorable. I always go to Day One of the Fair in Saint Paul with my “fair husband” Steve. We are particularly compatible as a fair couple because we like the same things, yes, but are also open to the choices of the other person. Plus, we share the food. cinnamon banana dark chocolate Jonny Pop. Quickie post to say that I am in serious training for the Great Minnesota Get-Together. Yes, you can count on coming back here in just a little over 24 hours – to get the full list of what I and my “fair-husband” will have eaten, shared, and delighted over. Time was (just look back at lists past) – that I could barely get all the items consumed on one page. Now, really — who has the stomach to eat that much. Ha! In training means: not too much eating beforehand. Taking good care of myself. Making room. And studying the list of the new foods. 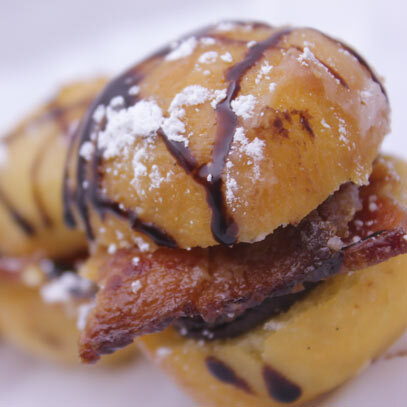 This is at the top of my list: Candied Bacon Donut Slider! It IS a donut hole – so don’t go judgin’. I’ll report back! Oh – late addition: how did I miss this one? 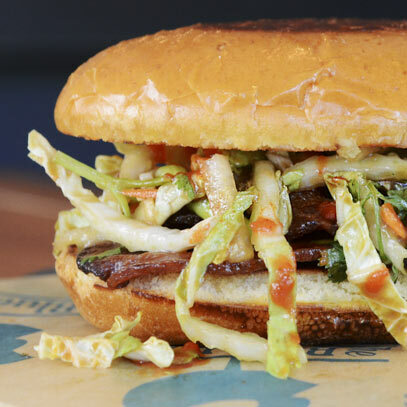 Crispy, thick candied bacon, rancher’s slaw and green tomato spread on a sweet egg bun. 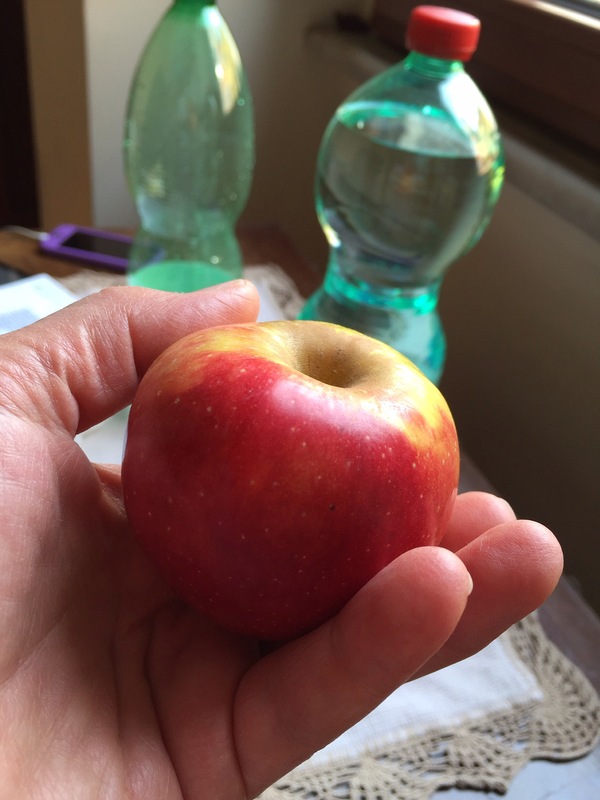 This little apple faces extinction in Bagnacavallo – the small Italian town not far from Bologna. It is called a Florina. It tastes like the essence of appleness: crisp when bitten, juicy but not slurpy, the perfect combination of sweet/tart. Like an apple, only better. I met Florina while visiting the home of Anna Tazzari – the creator of Signora Maria. Her husband Massimo explained to me that you could not buy this apple in a store – you could only pick it off a tree or buy it at a farm stand. Sad, this little Florina – I hope she makes it in the world of Honeycrisps. So busy going to the Minnesota State Fair, I have little time to chronicle my adventures, but follows is a quickie list of foods I have eaten — probably not in order, because I’m still digesting. Haha. Get it!?!? * Turkey-to-Go. How good can a turkey sandwich be? Come to the fair and find out. It’s near the Poultry Barn. * Walleye Roll (think lobster roll – but with flaked walleye: a Minnesota-based perch, wild rice! celery and lightly mayoed on a thick slab of open-faced bread touched with butter). This might be my FAVORITE dish at the fair! * Walleye cakes (like crab cake only with walleye and a tad bit of smoked salmon). Yum! Fruits and veggies in Berlin, Dresden, Prague and Brussels were good. But, I missed my salad!! One of my favorite dishes to seek out when traveling is rabbit cooked in almost any style. Coniglio in Italy. Lapin in France, or as it turns out, in Belgium. I ordered this Lapin, a saddle of rabbit, cooked in a type of Belgian Lambic called Geuze. Served with frites, of course. On the side: a simple, perfectly-dressed green salad. To drink: a flavorful blonde Belgian beer. He almost grimaced when my table mates ordered soup and fries. “As you like…” He muttered. With a slight smile on his face. It was fun. And, oh so good. Hippety. Hoppety. Then on to the chocolate shops. Ain’t no doubt about it, I hit the best. The BEST, the veritable mother lode of awkward English menus – at a great restaurant in Prague. But this was my favorite on that multi-lingual ode to gastronomy. Now doesn’t that just sound delicious? Spicy sausage of the chef. Yum. Yum.